BFD 8 Bit Kit is an expansion pack for FXpansion's BFD3, BFD Eco and BFD2 with dozens of esoteric, vintage and modified drums, percussion and beatboxes - all prepared and tuned in unique ways before being captured by a strange and wonderful array of microphones (in full 24-bit 44.1kHz quality!). 8 Bit Kit is the brainchild of S. Husky Hoskulds whose 8 Bit Audio production company has produced recordings for Tom Waits, Fantômas, Joe Henry, The Wallflowers and many more. 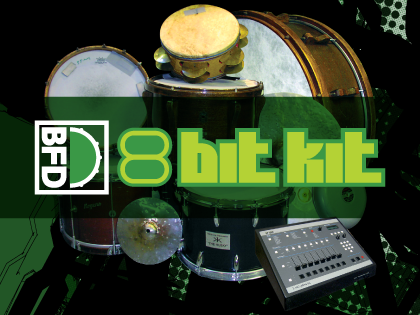 The philosophy behind 8 Bit Kit is to deliver fascinating and different sounds: kicks detuned and hit with paint rollers or with chains attached; modified snares with calf-skin or kevlar heads fitted; unique cracked and warped hihats. Other highlights include bongos, hand drums, tambourines, claps and junk percussion alongside vintage analogue drum machines recorded both dry and played out over a custom PA rig in the drum room - these sound great layered with other drums or naked in your mix. Selected sounds are also provided in 'amped' versions with additional texture and grit for your mix. 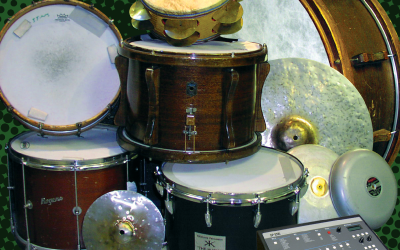 8 Bit Kit was recorded with mics as weird as the drums themselves including parabolic 'spy mics', Calrec Soundfields and mics with gramophone horns attached. The room used at The Sound Factory in Los Angeles offers an intimate, tight sound that sounds great on its own but also integrates well with the larger rooms in other BFD libraries.